When someone you love is ill, finding high-quality care is your top priority. At C-Care we understand that being in a familiar environment can improve quality of life and help to preserve dignity. That’s why we’re committed to providing compassionate, reliable, in-home professional assistance. With C-Care, you can be confident that your loved one is in good hands. Our in-home care gives individuals the convenience and personal attention to improve their recovery from illness. Our staff brings a high level of skill and expertise, while helping establish daily routines, general maintenance care, and the supervision of rehabilitative protocols. Receiving care at home helps make the process easier for those struggling with serious illnesses and cognitive declines. Because we provide expert staff for health care, many families are choosing to have the majority of care for their loved ones performed at home. Receiving medical support at home can provide familiarity to people in a way that can help their healing process. It can reduce much of the stress that accompanies health issues and keep them in close contact with their family. For many of our clients, this service allows them to remain in an environment where they’re most comfortable. People who have lost the ability to perform tasks for basic personal needs find that they can maintain their dignity when at home. It can also be a tremendous relief to people and their families who feel safer having them close by. In-home care can be a cost-efficient way to provide the necessary treatments to people who need them. Hospitals and nursing homes can be costly so this allows for the flexibility to schedule services when needed. Families can take part in the caring process and use in-home staff to help relieve some of the time needed to invest. Personal care and support: Assistance with dressing, feeding, washing, and toileting, as well as advice, encouragement, and emotional and psychological support. 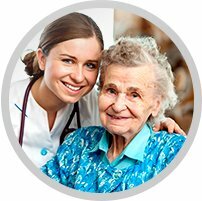 Eldercare: The level of elder care varies, from 24-hour care to a day nurse who drops in on older patients for a few hours every day. Since older people are prone to specific health problems, our professionals are trained to address these issues, ensuring the highest level of medical support. Home care assistance: The practitioner helps patients tend to their everyday needs at home. Home health care may include skilled nursing in addition to speech, occupational and physical therapy. In many cases, it includes assistance with household chores and monitoring the patient’s prescriptions. Professional healthcare services: Personal Support Workers, Registered Practical Nurses and Registered Nurses are trained and available to assist – no matter what circumstances your loved one is facing. Being at home gives people the privacy they need in their most difficult time since health issues can be demanding physically and emotionally. Involving the family in the caregiving process increases the reassurance that their loved ones are being cared for. Families gain peace of mind in knowing that qualified professional staff is close by to answer any questions. Communication is direct and can better meet the preferences of all family members. Our personal support workers bring compassionate and comprehensive care to individuals recovering from illness and surgery. Routine personal attending to, feeding, and social interactions help create an effective program for long-term health. C-Care is committed to providing the highest level of in-home care to individuals and their families. We understand how overwhelming it is to have the responsibility of caring for a sick or disabled family member. Our professionally trained health care providers are ready to help you navigate this demanding experience and help you make the best decisions possible. Because you need the best quality care, individual health needs are professionally assessed by our Clinical Consultants who are also experienced, Registered Nurses. After fully exploring and understanding your needs, your Clinical Consultant can confidently recommend the services that best suit your needs. For service rates or immediate assistance, contact us at 416-724-2273 or submit our online form.